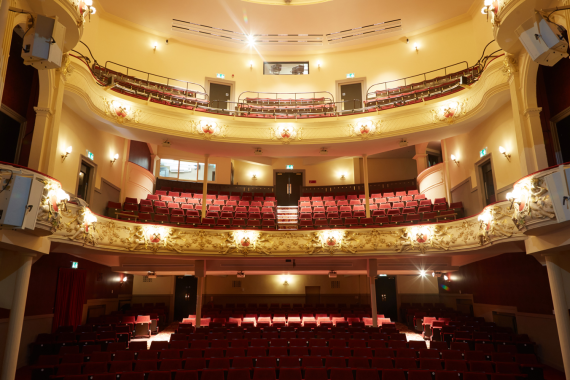 The Gaiety Theatre in Ayr is a 500-seat receiving house presenting around 200 professional and amateur performances a year. From panto and musical theatre, through drama and music to opera and ballet, the programme deliberately aims to offer something for everyone. With a history stretching over 115 years, our beautiful Edwardian auditorium is at the core of our operation. More than a theatre, we also: manage a rural touring network to 15 small locations around Ayrshire; run youth drama around Ayrshire and a young company at the theatre; partner with Ayrshire College and our local University UWS to deliver technical theatre qualifications and other opportunities; and work to extend the impact of the performing and theatre arts across Ayrshire. And as the base for the longest running touring theatre company in Scotland, Borderline Theatre Company, we have an increasing role in producing drama too.